When manufacturers look for inefficiencies to address, they often focus on the production line itself. Can automation improve operations? New manufacturing processes? Different staffing strategies? In fact, these strategies make up only a portion of efficient operation in the manufacturing industry. Material handling — getting raw materials to the lines, moving components between one station and the next, and eventually collecting and loading orders for shipment — makes up a surprisingly large portion of a product’s overall cost. According to an article published in the Journal of Industrial Engineering, material handling as a process can make up between 30 and 75 percent of a product’s total production cost. Improving efficiency in material handling tasks can cut costs by up to 30 percent, according to this research. Transport equipment must efficiently carry raw materials to production lines, and move finished products to packing areas. One solution is a train of Tugger Trailers with established routes; this is a highly flexible approach, as users can add or remove Trailers according to the moment’s needs. Manually positioning components and materials creates a strong risk of strain injuries for workers. In some instances, products are too heavy for workers to manipulate for their tasks. Manufacturing lines should include ergonomic positioning equipment into every workstation. These may include Tilt Tables, which place materials at a specific angle relative to the line. Lift Tables, meanwhile, create variable-height workstations to improve ergonomics and boost productivity. Once products are completed, manufacturers move them to packing stations. Many operations rely on pallets to ship orders. Building pallets carries its own ergonomic risks, as workers are required to stretch and reach outside their safe working zone, close to the body between the shoulders and the hips. Pallet Carousel and Skid Positioners are self-leveling, rotating pallet stations that keep all work within the worker’s safe zone. Organized storage also falls under the category of material handling equipment. Choose Material Racks designed specifically for products to limit the storage footprint and keep inventory safe until shipment. General Industrial Shelving typically has a place in manufacturing facilities, as well. According to a 2016 survey conducted by Modern Materials Handling magazine and Viastore Systems, Inc., decision-makers at manufacturing, warehousing, and combined facilities cite improved efficiency most often as their key goal in choosing new material handling systems. Of the decision-makers surveyed in 2016, 83 percent named efficiency as their first priority in purchasing material handling solutions. Following efficiency, 78 percent of respondents named maximizing uptime as the priority, while 75 percent wished to improve accuracy. The equipment discussed above will assist with all of these goals, while improving ergonomics to reduce injury rates in the workforce. 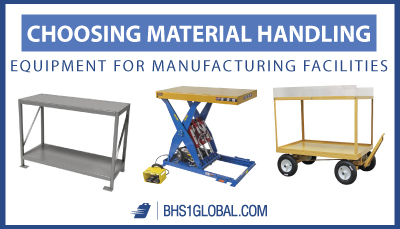 These solutions are an important part of any material handling system in a competitive manufacturing facility. Karande, Prasad and Shankar Chakraborty. “Material Handling Equipment Selection Using Weighted Utility Additive Theory.” Hindawi. Journal of Industrial Engineering, 2013. Web. 27 Nov. 2018. “Material Handling System Choices: Priorities and Partner Approaches of Purchase Decision-Makers.” MMH. Modern Materials Handling and Viastore Systems, Inc., 2016. PDF. 27 Nov. 2018.